My first experience with Mouse Made Simple was as a client. A friend of mine raved about her experience with the agency and suggested I give them a call. That was one of best calls I have ever made. Having someone walk me through the process of planning a Disney vacation as well as catering it to the ages of my kids was awesome! 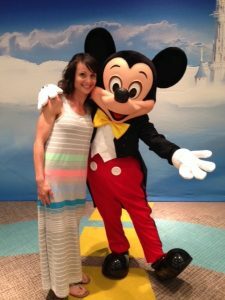 After a memorable trip with my family, I knew I had to be part of the Mouse Made Simple team. I wanted to help other families with their Disney vacations. I treat each trip as if I was planning it for my own family. I love that my clients can relate to me as a mom with kids and have been in their shoes. With my own experiences and training specific to Disney, this allows me to provide excellent insight. On our last family trip, I was taking a walk with my now 9-year-old daughter. I told her memories sometimes fade as you get older, though, you will always remember a Disney vacation. A few minutes later we stood on Main Street to watch the most spectacular fireworks. As my family watched the fireworks, I took a step back to take it all in, that moment was precious to me. Memories at Disney are not just about watching a child meet Mickey Mouse for the first time, it’s unforgettable memories for the adults too. I still remember my first trip to Disney when I was 7 years old. My parents not only bought me my first set of Mickey Mouse ears. They also bought me a Goofy hat since Goofy was and still is a favorite of mine. It does not matter how many times I see Cinderella’s Castle or watch the Electrical Parade, each time feels like the first. When I think of Disney two things come to mind, memories and loved ones. Some of my most cherished memories are those I have experienced at Disney with either family or friends. Whether it’s Disney World, Disneyland, Disney Cruises, or Adventures by Disney, my goal is always to custom create a magical vacation for my client.